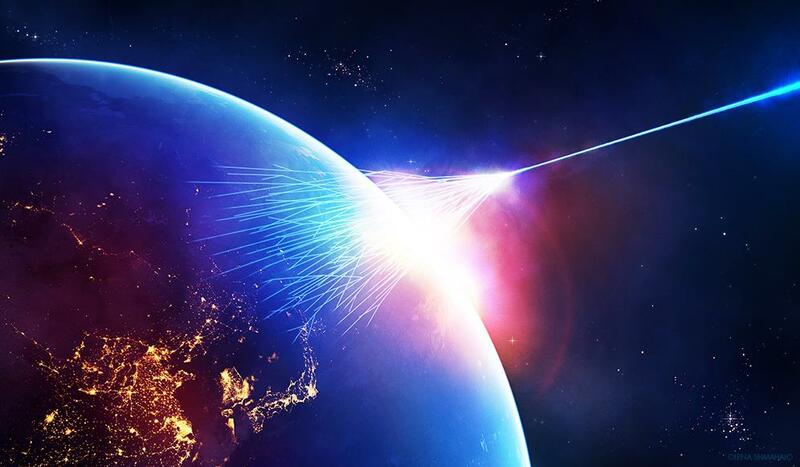 SYDNEY, Jan. 15 (Xinhua) -- In a remote part of Western Australia (WA), innovative new research is allowing local scientists to detect and study mysterious particles, of unknown origin, which smash into the earth's atmosphere at close to the speed of light. "These particles, if they were racing a piece of light across the galaxy, would arrive within a few 10 centimetres of the light," Project leader Dr Clancy James from the Curtin Institute of Radio Astronomy, told Xinhua on Tuesday. "When these smash into atoms in the Earth's atmosphere, the energy in those collisions could produce all kinds of exotic particles that we can't otherwise study." By coupling a particle detector with the Murchison Widefield Array (MWA) radio telescope, James and his team hope to observe the outcomes of these collisions as well as determining where these particles are coming from. While a similar particle detector and radio telescope experiment already exists in the Netherlands, the interference free environment of remote WA, provides a unique opportunity for researchers. "The important thing about this experiment is that's located in outback WA, far away from people, where they have very strict controls about what radio emissions you can generate." James said. MWA Director Professor Melanie Johnston-Hollitt, said the project pushes the boundaries of the telescope's capabilities. "This project enables a radio telescope to carry out particle physics that have never before been achieved in Australia," Professor Johnston-Hollitt said. "By pairing the MWA and particle detector in this study, we expect this to pave the way for much larger experiments."